Representative Honours: Ireland: 9 Full Caps (1911-1914). Harry Hampton's nine caps stood as a Bradford City record until surpassed by Jamaican international, Jamie Lawrence in the early-2000s. Hampton had come to the attentions of the Irish FA when his Irish-birth had come to light during his time with Dundee Reserves. He was selected at right-half for an international trial match for an "Anglo-Irish XI" against a "Home Irish XI" in January 1910. Signed by the Bantams from Dundee in March 1910, Hampton was mainly a squad player, slotting in at left or right-half as required. In City's 1911 FA Cup-winning campaign he played just once, in a second round 2-1 win over Norwich City. Hampton returned to Ireland in May 1914, signing for Distillery where he was used mainly as back-up to regular half-backs Bob McCracken, George Kay (later manager of Liverpool) and Tommy Milne. 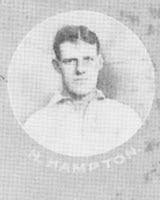 Hampton won his final cap in a 3-0 victory over England that helped Ireland to their first outright British Championship success in 1914. During the First World War, having returned to live in Bradford, he served with the Labour Corps between 1916 and 1919 and was discharged with an injury to his knee. Bradford City had retained an insurance policy in the case of such an injury occurring to Hampton. With his playing days over, Hampton settled in Derby where he worked for the Electricity Board. He died there in 1946 from acute heart failure and cancer of the lung and is buried in Nottingham Road Cemetery, Derby. Summary: 9/0. Won 3, Drew 0, Lost 6. * Many sources list Hampton's birthdate as 1 May 1890. However, this does not tie in with census details. With thanks to Harry Hampton's granddaughter, Janet and to Mrs C. Duttine for sharing their research. 14/04/15 (Belfast Charities Cup -1) Cliftonville 0 Distillery 5. As i passed all the research i have done on Harry Hampton( my mum in laws father) to Janet i think it a trifle unfair to pick out one person for "thanks"for the information. Bradford City Football Club were very helpfull when i asked fo any information regarding Harry.Harry Hampton also had 5 Grandson's and one of his caps is with a member of the family. Janet did mention that you had forwarded her much information and it was an oversight on NIFG's part that you have not been duly credited. We are happy to rectify that now. Could Mr or Mrs Duttine please contact me on ian.hemmens@gmail.com.